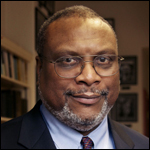 Quintard Taylor, the Scott and Dorothy Bullitt Emeritus Professor of American History at the University of Washington, Seattle is the founder of BlackPast.org. Originally from Brownsville, Tennessee, he received his B.A. from St. Augustine’s College in Raleigh, North Carolina, and his M.A. and Ph.D. from the University of Minnesota where he studied with Allen Issacman, Lansine Kaba, Allen Spear and Stuart Schwartz.